AKEED MOFEED (GB) (Bay 2009-Stud 2014). 6 wins-1 at 2-from 1400m to 2000m, Hong Kong Cup, Gr.1, Hong Kong Derby, L. Brother to SW Jordan Sport (Meydan Mahab Al Shimaal S., Gr.3). Sire of Assertive Play, Heart Conquered, Sunset Watch, Poised to Strike, Swing it Sister and of the placegetters Akeed, Avora Sun, Burning the Clock, Caterham, Inkslinger, La Vita, Lunch Money, Surreal Image, etc. His oldest progeny are 3YOs. OLIVIA LASS, by Mugharreb. 6 wins-2 at 2-to 1250m, A$88,315, SAJC Leabrook Farm Honey H., 3d SAJC Adelaide Exercise & Physiology H. Dam of one named foal. Olivia Lass. 6 wins. See above. Out of Coober. 5 wins-1 at 2-from 1300m to 1600m, A$220,450, SAJC P&R Electrical H., MRC Roy Higgins & Wylie Dalziel Racing & Tile Importer H., SAJC Tattsbet H., Mildura Cup, 2d SAJC Centrebet H., Oakbank RC The Advertiser H., 3d SAJC One Solution Mobile & Data H., Veolia H., 7 News H., 4th SAJC Sires' Produce S., Gr.3. Turf Cutter. Winner at 1600m, 3d SAJC Thiess Kentz Logicamms H.
Great Beginnings. 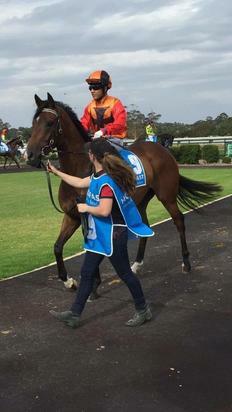 Winner at 1250m in Aust. Club Digger. Placed in Aust. Iseethingsyoudon't. 6 wins at 1200m, 1300m, A$165,875, WATC Merrywell H., Happy 60th Andrew Page H., Bendigo North Perth Community Bank H., Racing Radio 1206AM H.-twice, 2d WATC Crown Lager H., Perthracing.org.au H., Tabozbet.com.au H., 3d WATC Auto Classic Motorcycles H., HPM Legrand H.
OURS TO KEEP (Seidnazar). 3 wins at 2, A$277,700, in 2016-17, BRC BJ McLachlan S., Gr.3, Phelan Ready S., L, Skytrans 2YO P., 4th BRC Champagne Classic, Gr.2, Dalrello S., L.
Picavino. 2 wins at 2, 2d Ipswich TC Enjoy Schweppes H.
Picawinner. 6 wins-1 at 2-to 1400m in Aust. Patriots Day - Rainbow Oasis (H.K.). 2 wins at 1000m, 1200m, QTC Vice Regal Room H., HKJC Shek Uk Shan H., 3d HKJC Douglas H., Sports & Recreation H.
London Lass. 5 wins. See above. Victory Beau. 6 wins to 1200m in Aust. Ryan's Gift. Winner at 2 in Aust. Levelled. Placed at 3 in Aust. Tofu. Placed at 3 in Aust. Noble Glitter. 3 wins-1 at 2-from 1100m to 1600m, SAJC Lipman H., 3d SAJC Tobruk H.
Western Diplomat. 2 wins at 1400m, 1600m in Aust. KINGDOM BAY (Otehi Bay). Second on The 1984-85 NZ 3YO Free H. Second top colt on The 1983-84 NZ 2YO Free H. 13 wins-3 at 2-from 1000m to 1600m, NZ$232,810, A$89,500, New Zealand Two Thousand Guineas, Gr.1, WRC Evergreen Lodge S., Gr.2, Wellington Guineas, Gr.2, Wellington S., Gr.3, Te Aroha JC Thames Valley S., Gr.3-twice, BATC Black Douglas S., L, CJC Edward Lumley H., L, Hawke's Bay Guineas, L, Taranaki RC Grangewilliam S., L, Waipa RC Rose Town H., Feilding 10,000 3YO H., 2d AJC George Main S., Gr.1, QTC Stradbroke H., Gr.1, Manawatu Sires' Produce S., Gr.1, ARC Great Northern Guineas, Gr.2, WRC Wellesley S., L, Marton JC Metric Mile, L, 3d WRC Jarden Mile, Gr.1, QTC Ansett Cup, Gr.2, Levin RC Bayer Classic, Gr.2, ARC Radio Pacific H. Champion sire. Laud Eulogy. 8 wins from 1200m to 1600m, ARC Simpson Appliances H., Marton JC Jarden H., Avondale JC Lion Brown H., Waikato RC Committee H. Sire. Flying Class (Tuscany Flyer). Joint third top filly on The 2001-02 NZ 2YO Free H. 2 wins-1 at 2-at 1100m, 1300m, NZ$189,575, ARC Mercedes Super Bonus Fillies' Prelude, Counties RC Auckland Thoroughbred Transport H., 2d Matamata Breeders' S., Gr.2, Waikato RC Super Bonus Classique, RL, ARC Waka Nathan Quality Meats H., WRC Kitchen Creators Juvenile H., 3d ARC Swiss Deli H. Producer.